Americas gateway to the universe.March 18, 2005John F. Kennedy Space Center Spaceport Newshttp://www.nasa.gov/centers/kennedy/news/snews/spnews_toc.html Vol. 44, No. 6(See GLOBAL, Page 2) THE GLOBALFLYER (above) lands in Salinas, Kansas, after a 67-hour flight. AT LEFT, NASA personnel involved with the historic flight include, from left: Chris Forney, Jennifer Murray and Rich Nelson of NASA KSC; Steve Bundick, NASA Wallops Flight Facility; James Dumoulin, NASA KSC; Philip Grassa, Scaled Composites; Lisa Valencia, Erik Denson, Michael Downs and Dr. James Simpson, all of NASA KSC; Greg Coombs, Honeywell; and Jan Zysko, NASA KSC.By Jennifer Wolfinger Staff WriterNearly 70 years ago, Amelia Earhart bravely attempted to fly around the world. Following in her trail, Virgin Atlantics GlobalFlyer aircraft recently used some of Kennedy Space Centers technologies to set the record for the first solo non-stop flight around Earth. Through NASAs Space Based Telemetry and Range Safety (STARS) project, led by Lisa Valencia, KSC offered video transmission of pilot Steve Fossett during the historical 25,000-mile flight. The team also distributed the cockpits video signal to Kansas Mission Control, and provided streaming video, audio and still images, said Richard Nelson, KSCs chief of the Range Systems Design and Development Branch. Overall, STARS demonstrates the capability of a space-based platform to provide communication and tracking support for various launch vehicles. The aircraft is a singleengine model designed forKennedy technology helps GlobalFlyer set world recordcontinuous circumnavigation by one pilot and no passengers. It weighs roughly 22,000 pounds when fully fueled and can exceed speeds of 285 miles per hour. The GlobalFlyer has a 114foot wingspan and uses drag parachutes to slow down on final descent. After the successful flight, Nelson commented: KSCs technology did better than expected. It wasnt expected to last the entire duration of the flight, but it surpassed everything we had in mind. On Feb. 28, Fossett began his flight from Salina Airport in Kansas, which happens to be Earharts home state. Once the jet stream and weather conditions were satisfactory for flight, Fossett boarded the small quarters hed call home for the next 67 hours. He predicted the journey would take 66 hours. Fossett sat in a reclining seat Bush nominates Griffin as new NASA administratorPresident George W. Bush announced his intention March 11 to nominate Michael D. Griffin to be NASAs 11th administrator. Griffin currently serves as Space Department head at Johns Hopkins University Applied Physics Laboratory. Prior to his current position, Griffin was CEO of InQ-Tel, a non-profit enterprise funded by the Central Intelligence Agency to work with cutting-edge technologicalDr. Michael D. Griffincompanies that serve national security interests. Earlier in his career, Griffin served as chief engineer at NASA and as deputy for technology at the Strategic Defense Initiative Organization. He received a bachelors degree in physics from Johns Hopkins University; a masters degree in aerospace science from Catholic University of America; and a Ph.D. in aerospace engineering from the University of Maryland, among other degrees. SPACEPORT NEWS March 18, 2005 Page 2 Awards The Kennedy UpdateJim Kennedy Center DirectorMarch Employees of the MonthSTANDING IN the back row, from left, are: Pete Carrion, Chief Financial Office; and Robert Ruiz, ISS/Payload Processing. Sitting in the front row, from left, are: Dunamis Pedrasa, Procurement Office; Sherald Jordan, Cape Canaveral Spaceport Management Office/U.S. Air Force; Teresa Strobush, Information Technology and Communication Services; and Miros Guisbert, Spaceport Services.in the main fuselage, directly behind the nose landing gear and below the main engine. Potential noise problems because of the engines proximity were remedied with noise barriers and absorbers. Pressurization of GlobalFlyers cabin created a cabin altitude of 10,000 feet, although the aircraft was actually at 45,000 feet. To ensure Fossetts safety, KSC loaned its Personal Cabin Pressure Monitor,GLOBAL(Continued from Page 1)Greetings, folks! What an exciting couple of weeks its been, especially with the president nominating Dr. Michael Griffin as the new NASA administrator. While I know Congress still needs to confirm the nomination, I believe Dr. Griffin is an excellent choice. Ive been fortunate to work with Dr. Griffin in the past and look forward to serving with him as NASA safely returns the Space Shuttle to flight and carries out the Vision for Space Exploration. During his career, hes worked with our professional KSC work force on many occasions, so I look forward to his return trip to KSC to reacquaint himself with the Center and interact with our tremendous Space Coast community. Speaking of leaders, there is a super opportunity approaching for the KSC work force to hear from one of our highest leaders in government. Congressman Dave Weldon, who represents areas of KSC, will join me for an all hands from 1 to 2 p.m. March 24 at the training auditorium. Discussions will center on Return to Flight, the Vision for Space Exploration and KSCs future. While attendance is totally voluntary, I believe if you come youll receive tremendous insight into what Congress is discussing about the vision. Also, he will be able to provide information on how Florida is positioning itself to ensure the Kennedy Space Center maintains its leadership in the future of space exploration. If you cant attend, the event will be broadcast on our closedcircuit NASA TV and it will also be available on the Web. The next two weeks are going to be filled with excitement for the Space Shuttle Program, as well. First, the External Tank for STS-121 arrived Tuesday at the turn basin so it can be prepared for the scheduled July launch of Atlantis. But that was just the opening act for the hard-working folks in the Shuttle processing realm. Next week, after two years of preparation, Space Shuttle Discovery will roll from Orbiter Processing Facility bay 3 to the Vehicle Assembly Building. Discovery will be mated with its External Tank and Solid Rocket Boosters that are already there awaiting their launch companion. And if that wasnt enough, approximately seven days later, Discovery will roll out to Pad 39B to await its launch in May. Again, if you come to or tune in to the Mar. 24 all hands, youll hear more about this in detail. I want to put a plug in for our upcoming KSC picnic, taking place April 9 at KARS 1. If you havent been before, its a blast. Last year, nearly 8,000 people attended. Its loads of fun for the family, with great food and drinks, music, games for the kids and visits by astronauts. If it isnt on your calendar, you should put it on now. I hope to see you there. If you didnt realize it, we have less than 60 days until the opening of Discoverys launch window. I cant wait. Have super week, everyone! GlobalFlyer followed the jet-stream winds toward the United Kingdom and headed across the Mediterranean before turning toward Pakistan, India, China and Japan.which recognizes potentially dangerous or deteriorating cabin pressure conditions and alerts the pilot of the need for supplemental oxygen. However, because of the exceedingly loud cockpit noise, Fossett wouldnt notice if the original alarm sounded, so the monitor was upgraded with a body-shaking system to catch his attention. The Federation Aeronautique Internationale (the World Air Sports Federation) established rigid record-setting guidelines for the GlobalFlyer team. Once the single flight was completed, at least three records were set. The rules insisted the aircraft must take off and land from the same airfield, cross all global meridians and 80 waypoints and go beyond 23,000 miles, which is the length of the imaginary Tropic of Cancer line. After landing, Global Positioning System records verified the requirements were met. GlobalFlyer followed the jetstream winds toward the United Kingdom and headed across the Mediterranean before turning toward Pakistan, India, China and Japan. The flights final portion crossed the Pacific toward Hawaii before crossing Americas West Coast and returning to Kansas. Waypoints on the flight included Montreal, London, Paris, Rome, Cairo, Bahrain, Karachi, Calcutta, Shanghai, Tokyo, Honolulu and Los Angeles. Fossett crossed major flight routes, so he was visible to some commercial airline passengers. The aircraft wasnt easily visible from the ground, but onlookers could see its condensation trail. SPACEPORT NEWS Page 3 March 18, 2005Recognizing Our PeopleBy Linda Herridge Staff WriterTara Gillam sees her new position as director of Kennedy Space Centers new Office of Equal Opportunity (OEO) as a chance to step in and leave her own personal legacy on diversity management. I hope to incorporate diversity and equal opportunity management into more of KSCs strategic planning and decision making, said Gillam. Gillams goals include changing the work forces perception that the OEO is limited to processing discrimination complaints. While discrimination complaints are an important part of the offices responsibilities, there is a much broader role. Our outreach efforts will help to educate the work force on the mission of our office, Gillam said. Gillam plans to rely heavily on the special-emphasis groups at KSC to ensure that she understands their needs and represents their diverse views at senior management forums. An organization is the sumNew role as Equal Opportunity director inspires Gillamof many parts. When diversity is an element of the organizations makeup, the sum of those parts is exponentially greater, Gillam said. Through diversity in the work force, we all benefit from new ideas, ingenuity and diversity of thought. Another goal is to increase the use of alternative dispute resolution to manage work place conflicts. According to Gillam, resolving conflicts through mediation brings the parties and the issues to the table. This way, communication and understanding are emphasized and relationships between parties can be restored and maintained. Before coming to KSC in 2002, Gillam worked for 17 years at the National Institutes of Health in Bethesda, Md., as an employee relations specialist and later as a supervisor. For three years prior to becoming the new OEO director, Gillam worked as a specialist in KSCs Human Resources Office. Gillam earned a law degree from the American University Washington College of Law in Washington, and is a member of the Florida Bar Association. She has a bachelors degree, with a dual major in psychology and sociology, from the Regents College of the University of the State of New York. Gillam is married and has two sons, ages 20 and 17. Her husband, Daniel, is district ranger for the Canaveral National Seashore. Her interests include NASCAR, fishing, kayaking and enjoying the outdoors.TARA GILLAM, director of the Office of Equal Opportunity, will rely on the special emphasis groups at KSC to ensure that she represents their diverse views at senior management forums. Before working at the Center, Gillam worked for 17 years at the National Institutes of Health in Bethesda, Md.By Jeff Stuckey EditorWhen we hear stories of someone witnessing an accident and immediately acting to rescue a stranger, we can only hope wed move as quickly without thinking. Kevan Donewald, an AllPoints Logistics employee, found himself in this heart-pounding situation last month as he was heading to a doctors appointment from work and driving west on NASA Causeway. Hed just passed the new traffic signal after the Visitors Complex when a vehicle driving east crossed the medium in front of Donewalds vehicle, hit an embankment and landed in theAll Points employee shows life-saving braveryalligatorand snake-infested canal along the causeway. With no hesitation, Donewald slammed on his brakes, threw aside the contents of his pockets, kicked off his shoes and jumped in the water. He tried to open the vehicles door, but there was too much pressure against it. One of the windows was down, so Donewald pulled a woman out and safely led her to shore. It was nothing that any of us shouldnt do when the need arises, Donewald said. Things like this happen to me all the time and this was not a big deal. Emergency crews responded shortly afterward and treated the woman. Donewald was still covered with mud and green slime when he arrived at his appointment and asked for some towels to wash up. A former fire chief, Donewald has been quick to respond to other emergencies. He recently came to the rescue of a woman being attacked by two dogs. He has also revived an 18-monthold baby who choked on a hot dog and saved a woman who was ejected out of her vehicle and into a tree. I think we all need to take care of each other any way possible, Donewald said.KEVAN DONEWALD safely pulled a woman out of this canal. 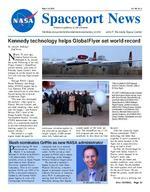 Page 4 SPACEPORT NEWS March 18, 2005 By Jeff Stuckey EditorTalk about progress. When United Space Alliance employee Chris Weldon discusses the advancements his For Inspiration and Recognition of Science and Technology (FIRST) robotics team made over the past four years, his infectious smile shows his pride in the Merritt Island High School students who comprise Team 801. Its all about trial and error, said Weldon, an information management engineer. Four years ago, this team finished 43rdout of 46 teams, the next year 26th place and last year sixth place. Then this year, we won first place at the Peachtree regional. We wont let up our guard. Weldons Team 801 and 46 other high school groups participated in the 2005 FIRST Robotics Florida Regional on March 11 at the University of Central Florida Arena. The competition combines the excitement of sports with science and technology to help high school students discover the rewarding and engaging world of innovation and engineering. Weldons twin son andFIRST Robotics Florida Regional insp i daughter, Kevin and Katy, were busy working on the teams robot while their father praised this years team. Katy, a junior who is home schooled, took a moment to reflect on the competition. Ive had a great experience and have met a lot of friends, Katy said. Everybody is so willing to help each other out. The reason I started this program was to learn about computers. This has shown me many interesting areas in the field, so Ive decided to pursue a degree in computer science. With the Florida legislature currently in session, Gov. Jeb Bush took time out of his busy schedule to welcome the students to the regional event. I came to tell you I want to be like Woody when I grow up, Bush said, referring to FIRST cofounder Woody Flowers, also in attendance. I hope you have a lot of fun, but also take the skills that you learn in this process and dream the biggest possible dreams. Make sure those dreams come true in Florida, he said. Dont go somewhere else when you graduate from high school. Make sure you stay here so our state will continue to prosper. The competition stages short games played by remote-controlled robots designed and built in six weeks by a team of 15 to 25 high school students, who receive help from engineers and mentors. Competitions involve 40 to 70 teams cheered by thousands of fans over two and a half days. Judges present awards to teams for design, technology, sportsmanship and commitment to FIRST. Michael Lane, an electrical engineer for NASA and mentor for the Kennedy Space Centersponsored Pink Team, is also proud to guide the next generation of explorers: You mentor the students to where they learn part of a trade during six weeks, Lane said. Through design, building, fabrication and testing, it is a proving ground for what you learn over the six weeks. After the first practice day, you learn a lot and try to tweak parts as you go. The NASA Pink Teams robot driver, Sean Argo, and his teammates were excited after opening the competition with a win. We worked out some kinks with the robot yesterday, and today everything is running smoothly, Argo said. It was refreshing to start out so well. There are a lot of great robots here and its good to see such a great turnout in our first competition. KSC co-sponsors the regional event with the University of Central Florida, along with many industry partners. KSC Director Jim Kennedy said hes thankfulAT LEFT, Florida Gov. Jeb Bush talks to members of the KSC-sponsored Pink Team before its opening match at the FIRST Robotics Florida Regional. BELOW, Pink Team member and robot driver Sean Argo (fifth from left with wig and sunglasses) concentrates on his teams opening match, while mentor Andy Bradley (with headband and sunglasses) discusses strategy with an alliance team member. Page 5 SPACEPORT NEWS March 18, 2005 i res next generation of explorersof the roles the engineers and mentors provide to the students. The way these KSC employees give their time and knowledge reminds me of the generosity of the NASA family, Kennedy said. It is not just a job with these people, its a passion. The fact that they can invest in the next generation of explorers on their own time to help them get inspired about math, science and technology is a very inspirational thought for me. Kennedy said he continues to be impressed with the enthusiasm of the students. What I will never forget is when I toured the pits where the damaged robots are repaired and the KSC-sponsored Pink Team 233, made up of students from Cocoa Beach and Rockledge High Schools, were like the Maytag repair man, he said. Their robot performed beautifully and did not need repair, so I asked them what they did when everything worked perfectly. Their answer was profound: We go out and help our friends on the other teams. Are we helping to ingrain integrity in the youth of this nation? Yes, I think we are.PINK TEAM members cheer on their robot during the FIRST Florida Regional. The team, comprised of students from Cocoa Beach and Rockledge High Schools, won the event. CENTER DIRECTOR Jim Kennedy (left) talks to NASA electrical engineer Mike Lane about the teams robot. REMOTE-CONTROLLED robots face off at the For Inspiration and Recognition of Science and Technology competition. The event stages short games played by robots designed by high school students and their mentors. AT RIGHT, the pits are busy as teams repair and adjust their robots during competition. Judges present awards to teams for design, technology, sportsmanship and commitment to FIRST. Page 6 SPACEPORT NEWS March 18, 2005Workshops on NASA's Core Values aids Center's futureThe Change Leaders Network is leading a series of workshops to promote NASAs Core Values, which include safety, the NASA family, excellence and integrity. The workshops are designed to collect input that will positively influence the Centers future. Already under way, the Core Values Emphasis Project involves a group of employees in a two-hour, facilitator-led group session. Participation in the focus group will strengthen the understanding of the Core Values, which are a critical cultural element supporting the Agencys success. I am thrilled the CLN has been given the opportunity to develop and implement the Core Values Emphasis Project, said Susan Kroskey, CLN senior executive advisor. They have developed a first-class focus group experience to learn more about our Core Values. Im very proud of CLNs contributions in support of the KSC Core Values initiative. Agency administrators addressed these values and NASAs ongoing culture transformation during an all hands meeting March 7 at the KSC TV Auditorium. Broadcast to the Center on NASA TV, officials at the all hands including Center Director Jim Kennedy, NASA Deputy Associate Administrator for Institutions and Asset Management Jim Jennings and KSC Change Manager Phil Meade agreed that changes will take time and will ensure success for the Vision for Space Exploration. We are starting off with a beautiful and rich culture in this Agency, Kennedy said. My view is we are changing this culture from good to great. We have a culture that Ive been proud of for 35 years and we, together, will make it better. Meade told the audience the NASA values will be woven into the Agency as it moves forward. These cultural enhancements are very foundational to the transformation activities that are going on within NASA. Summing up the NASA changes, Jennings acknowledged the transformation depends on the leadership of the Agency. We definitely have the leadership in place at KSC to make this a reality. Everybody understands what good management is and how they feel when they are respected and listened to at work, Jennings said. Employees are encouraged to view the NASA Core Values Video at http:// www.ksc.nasa.gov/nasa-only/ internal.html .SUSAN KROSKEY (center), Change Leaders Network senior executive advisor, leads a "Core Values Emphasis Project" workshop.By Michael Buckley John Hopkins University Applied Physics LabIn March 1930 the Lowell Observatory in Arizona announced the discovery of a small, odd world, roaming beyond the known planets in a region barely visible through the most powerful telescopes. Seventy-five years later, that historic find Pluto remains almost as much of a mystery as it was then. No spacecraft has ever visited it, and not even the Hubble Space Telescope can spot details on its rocky, icy surface. Yet with NASAs New Horizons mission, now in development and planning for liftoff in January 2006 from Launch Complex 41, the Agency looks to unlock one of the Solar Systems last, great planetary secrets. A Draft Environmental Impact Statement (DEIS) for the New Horizons mission has been released for a 45-day public comment period that ends April 11. The document is available on the Web at http:// spacescience.nasa.gov/admin/ pubs/plutoeis/index.htm or in the KSC library. On March 29 and 30, NASA will host meetings at the Florida Solar Energy Center in Cocoa, where the public can comment on the DEIS and learn more about the proposed mission and the steps NASA is taking in deciding whether or not to conduct the launch. After these National Environmental Policy Act reviews, if NASA decides to proceed with the mission, the spacecraft would await presidential approval to launch in January. After launch aboard an Atlas V, New Horizons would cross the entire span of the Solar System in record time, and conduct flyby studies of Pluto and its moon, Charon, in 2015. The seven science instruments on the piano-sized probe would shed light on the bodies surface properties, geology, interior makeup and atmospheres. It would mark humankinds first voyage into the third zone of the Solar System known as the Kuiper Belt, populated by smaller, icy objects different than the rocky inner planets or the outer gas giants. The National Academy of Sciences placed the exploration of the third zone in general, and PlutoCharon in particular, in its highest-priority planetary mission ranking for this decade. The power source for the spacecraft, a Radioisotope Thermoelectric Generator (RTG), uses heat from the decay of plutonium dioxide to produce electricity. The DEIS examines potential environmental impacts under three scenarios: a normal launch; a launch accident with no radiological release from the RTG; and a launch accident involving a radiological release.Meeting will address NASA's New Horizons missionARTIST'S CONCEPT of the New Horizons spacecraft.According to the DEIS, the most likely outcome is a successful launch. A less likely scenario, a non-radiological launch accident, would result in the same potential impacts as other expendable launch vehicle accidents. The least-likely scenarios include an accident resulting in a radiological release, though safety studies indicate that most releases would not harm people. Page 8 SPACEPORT NEWS March 18, 2005 John F. Kennedy Space Center Managing editor. . . . . . . . . . . . . . . . . . . Bruce Buckingham Editor. . . . . . . . . . . . . . . . . . . . . . . . . Jeff Stuckey Copy editor . . . . . . . . . . . . . . . . . . . Corey Schubert Editorial support provided by InDyne, Inc. Writers Group. NASA at KSC is located on the Internet at http://www.nasa.gov/centers/kennedy USGPO: 733-049/60077Spaceport News Spaceport News is an official publication of the Kennedy Space Center and is published on alternate Fridays by External Relations in the interest of KSC civil service and contractor employees. Contributions are welcome and should be submitted two weeks before publication to the Media Services Branch, IDI-011. E-mail submissions can be sent to Jeffery.Stuckey@ksc.nasa.govMercury 13 team stands out during Women's History MonthThe Disability Awareness and Action Working Group is hosting an introductory sign language course. This is a three-week course held once a week for three consecutive weeks, including March 22,Sign language class offers three sessionsMarch 29 and April 5. Each class is from 10:3011:30 a.m. in O&C room 2004. Space is limited. Contact Lisa Arnold at 861-3774 or Lisa.R.Arnold@nasa.gov .MARTHA ACKMANN, author of "The Mercury 13: The True Story of Thirteen Women and the Dream of Space Flight," spoke March 2 at the KSC Training Auditorium to celebrate National Women's History Month. Space Gateway Support (SGS) recently received the 2004 George M. Low Award at the 19th NASA Continual Improve ment and Reinvention Conference held in Alexandria, Va. The award is presented to large and small business applicants in the product or service categories that demonstrate an exceptional level of quality and technical performance in NASA-related contracts or subcontracts. Acting NASA Administrator Fred Gregory presented the award to William Sample, SGS president, at the March 2 ceremony. The last time a Kennedy Space Center contractor won the award was Grumman Technical Services Division in 1991.Space Gateway Support receives NASA's George Low AwardBike Week extends to the Visitor ComplexMOTORCYCLISTS PARTICIPATING in this year's Bike Week had a chance to take a photograph in front the Space Shuttle on display at the Visitor Complex. Pictured is Center Director Jim Kennedy on his 2005 Harley Davidson Road King Classic. By Elaine Marconi Staff WriterAs the nation celebrates the contributions of women during National Womens History Month in March, NASA recognizes several of Americas female citizens who made historic strides into the unknown for the possibility of traveling into space. The contributions were among those highlighted at a celebration of Womens History Month March 2 at the Training Auditorium. Among these heroes is the Mercury 13, a team of 13 brave women who shared a dream: to be Americas first women pioneers in space. Dr. William Randolph Lovelace designed the tests for male astronauts and became curious to know how women would do taking the same tests. In 1960, Lovelace secretly invited Geraldyn Jerrie Cobb, an exceptional female pilot, to undergo the rigorous challenges. Cobb, already on her way to being one of the worlds best pilots, became the first American woman to pass those tests. Most of the candidates were already accomplished airplane pilots and recruited through the Ninety-Nines, a women pilots organization. This group of highly skilled women accepted a challenge to be tested for a position as part of the U.S. space team. The testing then was known as the First Lady Astronaut Training (FLAT) program. These women underwent grueling tests equal to the kind the Mercury 7 crew experienced, in hopes of becoming part of Americas winning team of the space race. Thirteen women passed with flying colors and were chosen for future training. The First Lady Astronaut Trainee finalists were Jerrie Cobb, Wally Funk, Irene Leverton, Myrtle k Cagle, Janey Hart, Gene Nora Stombough (Jessen), Jerri Sloan (Truhill), Rhea Hurrle (Woltman), Sarah Gorelick (Ratley), Bernice B Trimble Steadman, Jan Dietrich, Marion Dietrich and Jean Hixson. Although the FLAT program was discontinued, these women went on to extraordinary achievements in other endeavors and their message of promise, possibility and purpose remains strong to this day. In time, the group changed its name to the Mercury 13.